TRS working president KT Rama during an informal interaction with mediapersons in Hyderabad on Sunday. 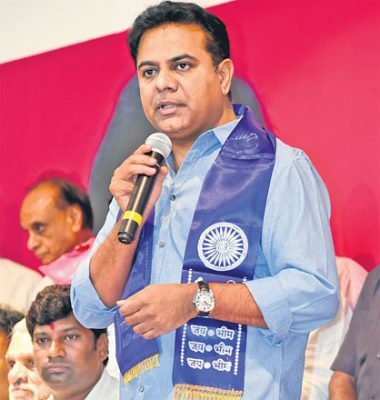 Hyderabad: TRS working president KT Rama Rao on Sunday said the State government will focus its attention on fulfilling all the electoral promises it had made beside bringing in administrative reforms across the State once the Lok Sabha election results are announced on May 23. “It was only to meet this objective and to ensure that there are no more roadblocks due to the Model Code of Conduct that the State government obtained special permission from the Election Commission of India (ECI) to conduct elections to Mandal Parishads and Zilla Parishads before May 23,” he said. The ECI gave its nod to the State Election Commission to hold polls to local bodies after it satisfied itself with the preparedness of the administration. Accordingly, the polls are likely to be held in two-three phases before May 20 and results will be announced after the Lok Sabha results are declared on May 23, Rama Rao said. “Thereafter, the TRS government will have enough time to fulfil all its promises and continue with the ongoing programmes. However, the municipal elections will be held only after the new Municipal Act is enacted in the Assembly, and the election process would last only a brief period,” the TRS working president said, during an informal interaction with mediapersons here. Stating that Chief Minister K Chandrashekhar Rao was keen on bringing perceptible changes in the functioning of municipal bodies and making them corruption-free as well as citizen-friendly, he said the government will, accordingly, bring in new Municipal and Revenue Acts, besides the new Panchayat Raj Act that has already been passed by the Assembly recently. Rama Rao, however, said the Hyderabad Municipal Corporation Act and Telangana State Municipalities Act will continue to co-exist even after the new Municipal Act is enacted. “Hyderabad is emerging as a global city and one cannot club it with other municipalities in the State as it might need separate norms for better governance,” he added. When asked about some revenue employees expressing apprehensions about the new Revenue Act and proposed reforms in the department, the TRS working president dismissed such doubts. “It will not have any impact on the functioning of government employees. Reforms are being brought in for effective and transparent governance. To a large extent, the government employees in various departments are doing their work sincerely without seeking bribes. It is only a handful of people who are bringing a bad name to the department as well as the government,” he said. Meanwhile, the TRS is also keen on focussing attention on strengthening the party from the grassroot level through various activities, including membership drive. Soon after the local bodies elections, Rama Rao is likely to tour the State and hold meetings with the party cadre in this regard.